Simple image that conveys a clear message. Classic? How does that thing dispense seeds? In one of the only shorts shown this episode, an office scene was displayed where it turned out that the employee had some kind of back problems that his manager was attempting to fix. It's surprising to see such "random" characters suddenly, although it's been happening for the last few episodes (i.e. the baseball club). It's obvious that anyone shown in the ED is fair game (we even saw a flash of the "magician" with a top hat in the last episode, in Mio's manga scene), but it's still surprising. It is definitely nice to have a collection of "background" characters that are defined in various ways; it really adds more depth to the story. 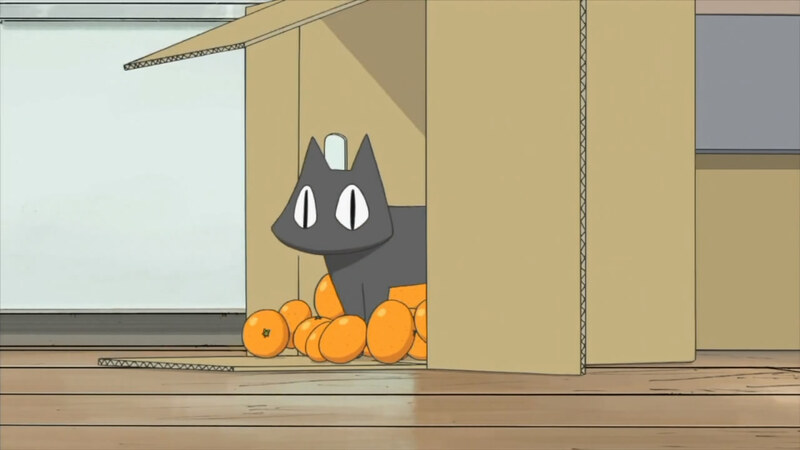 Having too many foreground characters usually muddles things up more than acceptable. Life is like a truck. It'll hit you. 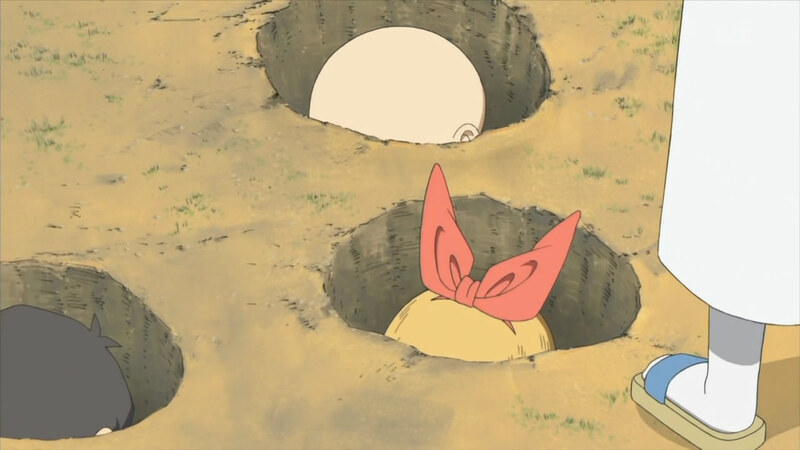 Nakamura-sensei is still out to get Nano, in her typically silly ways - this time, it was digging a hole and lining it with super glue. Unfortunately, she trapped Nakanojo instead...and, in order to make sure a piece of him wasn't visible, she shaved off his mohawk. I wonder if this will carry over to remaining scenes? Meanwhile, Takasaki-sensei (I have yet to be able to remember his name on my own...) encountered Makoto and, despite wanting to start up a conversation about go-soccer, ended up asking point-blank about Sakurai-sensei's availability. This led to inevitable understanding on Makoto's part that his sister had an admirer and he, after learning that Takasaki-sensei was a go-soccer veteran, attempted to use blackmail to get him to be the club's advisor. Sadly, her traps did work. Just like last time this happened, this scene was pretty long and incorporated different stories. During the moment of decision, where Makoto was heading off to unknown people to reveal Takasaki-sensei's feelings, Annaka showed up with news of Nakanojo's predicament (it made me remember that Nakanojo was the victim of Nakamura-sensei's ill-advised Mr. Short Circuit), which led to a very, very familiar exchange between the two. 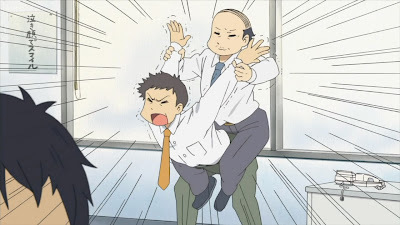 Of course, Makoto assured the teacher that he wouldn't tell anybody, although he still wanted him to be the club's advisor, thus allowing Takasaki-sensei to run off to Nakanojo's aide. 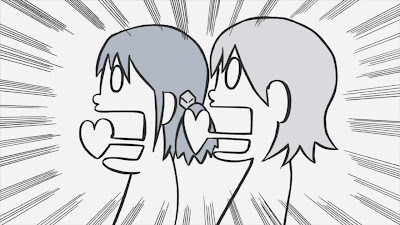 While the resolution wasn't shown last time, it was with this predicament: both Takasaki-sensei and Annaka fell into additional holes of super glue. 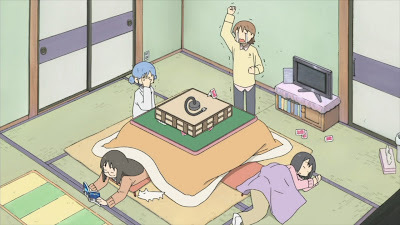 The final long scene of the episode continued the first story of Yukko and Mai, with Yukko vowing to no longer react to Mai's attempts. (I guess she didn't want a hilarious school life anymore?) 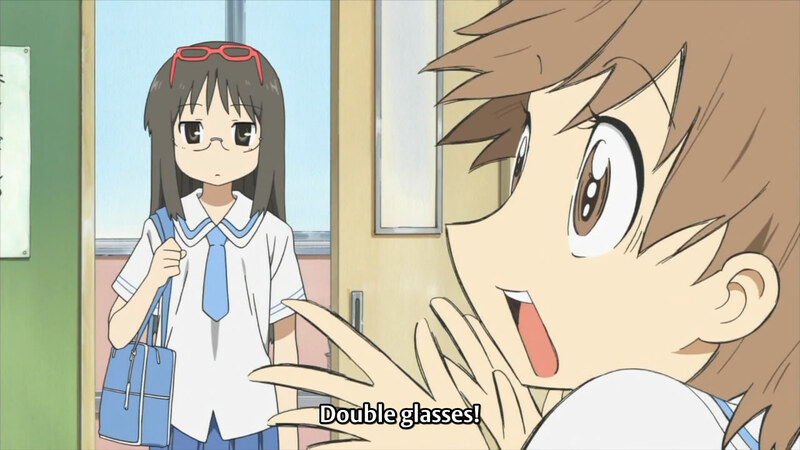 Mai, as if knowing, showed up to school with two pairs of glasses...and then proceeded to search the floor for her glasses in the very familiar "megane...megane..." bit. 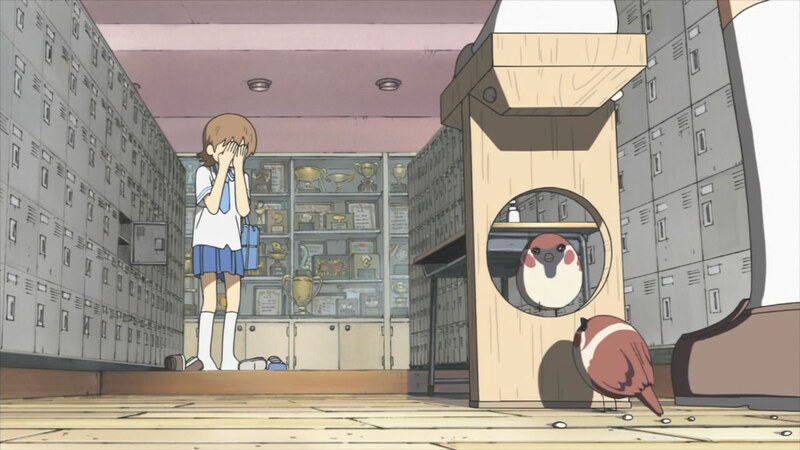 Yukko did her best to avoid reacting, but she couldn't take it anymore when Mai began reading the textbook out loud to the class - except her book was blocked by manga, meaning she had memorized the chapter (she better be getting perfect on her tests...). The scene ended with Yukko shouting in reaction and then excusing herself to the hallway, and Mai revealed that she had been, on top of it all, wearing contacts the entire time. Apparently, the Yukko-Mai combo is here to stay. Sakamoto looks even cuter without the scarf. With a slightly different episode this week, I can't help but feel that the transition was pretty fluid. 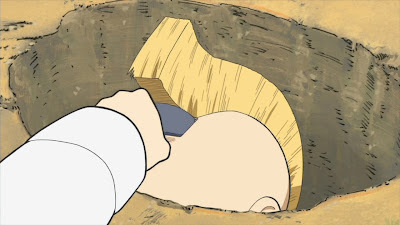 I've been noticing differences in the last few episodes, and this week just capitalized on it further. With the end of this long series fast approaching, I really wonder if this new formatting is permanent or not.